Bad Robot Productions is an American film and television production company owned by J. J. Abrams. It is responsible for the television series Alias, Lost, Fringe, Person of Interest, Revolution and Westworld alongside the feature-length films Cloverfield, Star Trek, Super 8, Star Trek Into Darkness, Mission: Impossible – Ghost Protocol, Mission: Impossible – Rogue Nation, Star Wars: The Force Awakens, 10 Cloverfield Lane and Star Trek Beyond. 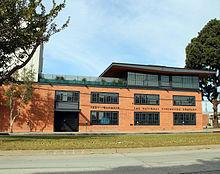 Bad Robot Productions headquarters in Santa Monica, California. Bad Robot Productions (more commonly known as Bad Robot) is an American film and television production company owned by J. J. Abrams. It is responsible for the television series Alias, Lost, Fringe, Person of Interest, Revolution and Westworld alongside the feature-length films Cloverfield, Star Trek, Super 8, Star Trek Into Darkness, Mission: Impossible – Ghost Protocol, Mission: Impossible – Rogue Nation, Star Wars: The Force Awakens, 10 Cloverfield Lane and Star Trek Beyond.